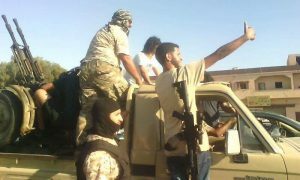 Fighting which has raged since Sunday in and around Garabulli, to the east of Tripoli, has died down today. The violent artillery and gunfire exchanges have reportedly seen some 85 percent of the townspeople flee. But the battle may be moving elsewhere. The TRB put out a statement saying it had driven back the attackers. These included members of Sala Badi’s Samoud militia and the Benghazi Defence Brigades. Yesterday it was being reported that 330 vehicles with heavy artillery had arrived from Misrata to join the battle. However, a source has told this newspaper that the TRB has not in fact taken over all of Garabulli. Moreover, it seemed that some of the attacking forces may have moved off south toward Tarhuna to approach Tripoli from the south. Yesterday the Nawasi Brigade of Abdul Rauf Kara pulled back from Garabulli. Today some of its units were reported to have been seen to the south of Qasr Ben Gashir and Tripoli International Airport, where an Italian consortium is due to start rebuilding the destroyed terminals. In the course of the heavy fighting for Garabulli, hospitals in Tripoli recorded four deaths and 21 injuries. Two of the dead were foreign workers. Casualties among the attacking forces are not known. Since Sunday, Garabulli residents have been unable to fleeto Tripoli because the road had been blocked by members of the Rahabat Al-Droua militia . This body normally supports the controversial Sheikh Sadek Al-Gharaiani who backs Ghwell. It said it had erected sand berms across the highway to protect the capital. Today those barriers were removed and the link with Tripoli was restored. What has yet to be restored are full power and communications. Electricity and fibre optic cables were both damaged during the fighting and engineers had been unable to get into the town to make repairs.